Program Description: We are thrilled to collaborate with Kuumba Dance & Drum Academy and Operation Unite Education and Cultural Arts Center, as part of our Music in the Stacks programming. Join your neighbors to make music and community! Never been to a drum circle before? A drum circle is a group of people, both professional and non-professional playing hand-drums and percussion in a circle, learning and practicing traditional and improvisational rhythms in a relaxed environment. Drums will be available to borrow, and please do bring your own, or a hand instrument if you have one. Ujima Community Collective Drum Circle features guest instructors Olympia and John Ward. John has been obsessed with playing West African drums and percussion for the past 25 years. After being introduced to the drums by his wife, he took to the instrument and ran with it. John studies regularly with master drummers from Guinea and Mali, West Africa, and now, as a full-time percussionist, plays for dance classes, gives group and private drum lessons, and performs with his percussion ensemble, ‘Sewa Folee’ (Joyful Music). 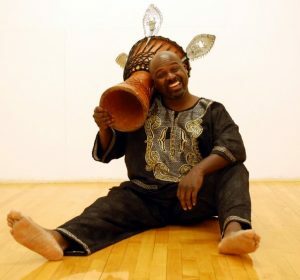 John has performed with artists such as Babatunde Olatunji and his Drums of Passion; Kemoko Sano, choreographer for Les Ballets Africains; and the National Dance Company of Guinea, and has played for master classes for Alvin Ailey, Jose Limon, and Paul Taylor Dance companies. Olympia Avignone Ward has played drums for over 25 years and studied a variety of traditions: West and North African, Middle Eastern, Caribbean, Brazilian, Native American, and southern Italian. She has played in various performance groups including Alessandra Belloni’s Daughters of Cybele, Sewa Folee, High Peak Drummers and has played with Ubaka Hill. She facilitates drum circles and teaches drumming in various communities. Operation Unite Education and Cultural Arts Center is a local, non-profit organization focused on education and cultural arts. Its mission is to produce well-rounded, progressive youth who will enter adulthood with a sense of direction, self-esteem and social consciousness and subsequently reinvest themselves into the community from which they came. This event is free and open to the public. It will take place in the main area of the library, which is wheelchair accessible. For more information email programs@hudsonarealibrary.org, call 518.828.1792 x101, or visit the main desk. This entry was posted in Adults, Children, News, Programs, Young Adults and tagged drum circle, john ward, Kuumba Dance and Drum, olympia ward, Operation Unite, ujima by Erica Nance. Bookmark the permalink.